You guys are probably looking at the author for this post and wondering who the heck I am. In the words of the immortal Damian Leigh, “He doesn’t even go here!”. While I am new, I am extremely​ excited to be joining the RotoCurve team. In the past, I’ve done work at sites such as RotoViz, numberFire, and Fantasy Insiders. You may have even caught a couple of my guest appearances at Rotoworld. After what feels like forever, NFL football is back! The world’s greatest sport will be making a return just as it has every year; the Hall of Fame Game. DraftKings has been doing a great job with pre-season DFS contests the last few years, and this year we have something completely new with a Showdown slate posted for the Hall of Fame Game. But what is the best way to attack this Hall of Fame Showdown? That’s what I’m here for. 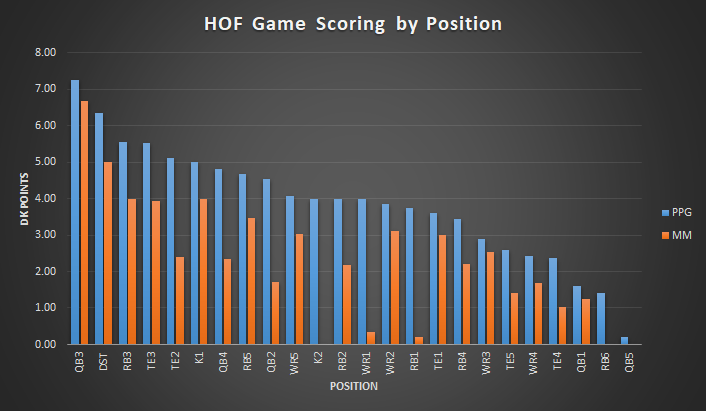 Which Position Generates The Most HOF Game Points? A huge difference between pre-season and regular season NFL is that there are a lot more players at our disposal. That is built up even more due to the format of Showdown. Instead of having designated positions that need to be filled in, Showdown requires six players at any position. So not only do we need to figure out what positions score the most points, we need to know specifically where on the depth chart those players tend to come from. Note that the chart displays DraftKings points per game in blue for each position and depth chart ranking that scored points. So “QB3” means the third QB on the team’s depth chart. The orange (MM) stands for Minus Max. I very simply just took out the highest scoring player at each position, and calculated the average again. This helps to see just how strong each position truly is. For instance, you’ll notice huge dips at TE2 and QB4. That is because they were small sample-sizes (just five total players combined) buoyed by a big performance. A cursory look at this information tells us that we should be targeting QB3, DST, RB3, TE3, K1, and RB5, in general. I recommend taking a look at the injuries for each team as well, as they will open up additional playing time. Lamar Jackson, QB, BAL – Jackson feels like a lock to be one of the highest owned players on the slate, but it’s not without reason. Robert Griffin should start the game, and Raven beat reports are expecting he and Jackson to shoulder most of the load on Thursday, with Josh Woodrum cleaning it up at the end. Jackson’s playing time projection is not elite, but he can do a lot in little action due to his dual-threat skill-set. Tyler Bray, QB, CHI – Everyone is going to be tripping over themselves to play Jackson, but I actually think Bray will end up being the sharp pivot. Assuming neither starter plays in this game, the Ravens will still have three QBs to get playing time over the course of the game. Chicago has just two, and one of them is veteran Chase Daniel, who has played under head coach Matt Nagy before. Bray could see up to three quarters in this game, while no other QB probably sees more than a half. Ryan Nall, RB, CHI – Nall is an undrafted rookie out of Oregon State who displayed a versatile skill-set in college. Benny Cunningham and Taquan Mizzell likely have a battle for a roster spot on their hands, but it certainly won’t be decided Thursday night. There’s a decent chance it is Nall who carries the load while trying to prove he belongs on an NFL roster. He has been getting a lot of buzz around Bears camp. Nick Keizer, TE, BAL – TE has been a pretty high-scoring position in the Hall of Fame Game. in fact, the two highest scoring games in the past three seasons have been at TE. Keizer has a chance to make a similar impact on this slate. Veterans Nick Boyle and Maxx Williams have deep injury histories and should not play much. Mark Andrews has not practice, and is not expected to play. Hayden Hurst missed time this summer with an injury, and has only been back practicing for about a week. Even Vince Mayle is only a couple of weeks removed from the PUP list. That leaves Keizer as the only TE on the roster who is fully healthy, and not an established veteran. Cody Parkey, K, CHI – A kicker!? Yes, the math would suggest that kickers are actually decent investments in this game. Parkey is the only kicker on the roster, and should see all of the work on Thursday night. Do not make the mistake of assuming the same is true for Justin Tucker on the Ravens. Undrafted rookie Kaare Vedvik is listed as a punter, but also kicked while at Marshall. Both DSTs – Again, the research has pointed out that DSTs can provide quality scoring on this slate. Two of the top 10 scoring performances over the last three years have been DSTs. It may even be a good strategy to play both of them in the same lineup, as that could be a unique roster construction with quality upside.